The Vancouver City Council passed the Low Carbon Energy System residential rezoning program on November 15th. This ground breaking development by-law facilitates the application of proven European technology that effectively recycles atmospheric energy for heating, cooling and domestic hot water in residential developments. The technology offers developers, designers and consumers the opportunity to dramatically reduce, if not eliminate, all operational carbon emissions from the living environment. This program offers year round climate comfort supported by the fairness of in-suite metered “user-pay” for energy consumption. The initiative leads the way forward towards environmentally responsible living accommodation while ensuring that the development industry retains the mandate to provide innovative and cost effective technical solutions. The technology supports the efficient and effective application of BC Hydro by using high performance heat pump technology to recycle free energy from the atmosphere and use it to create comfortable and healthy interior environments that have excellent acoustics and superior ventilation. 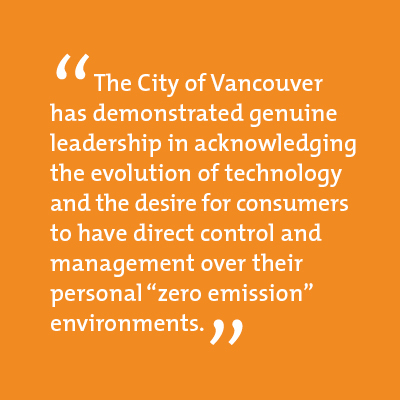 The City of Vancouver has demonstrated genuine leadership in acknowledging the evolution of technology and the desire for consumers to have direct control and management over their personal “zero emission” environments. We believe that the development industry, the design profession and all Municipal governments can follow this lead and move towards consumer focused, building specific, zero carbon emission energy solutions that will exceed the evolving standards being set by the Federal and Provincial governments. We welcome the opportunity to be involved in this consumer focused program of environmental responsibility, and look forward to sharing the technology and process with your team. The smartforme° program represents option 3 of the attached report – “User Owned On Site Low Carbon Energy System”.